Manufacturers need to control processes to produce a consistent, reliable product. Where precision surface engineering is required, surface measurement is a key part of maintaining control of the process. Laser interferometers are widely used in industry for the measurement of small displacements, refractive index changes and surface irregularities. When built into inspection equipment, like a coordinate measuring machine (CMM).a laser interferometer system reports the surface condition of a product with more accuracy than any other method. These CMM laser interferometry surface measurement systems, however, can be negatively affected by plant low-frequency vibrations, which can distort the interferometry measurements and deliver inaccurate readings. One specific CMM system, designed and manufactured by Arnold Gauge Company, has directly addressed the vibration issue. The company's CMM system maintains its throughput by integrating a compact negative-stiffness vibration isolation platform. "Every second, the laser in the CMM is generating about 2,000 readings," said Michael Bruins, president of Arnold Gauge Company, "These readings, taken at the micron level, are displayed on a chart and plotted against the pre-engineered ideal surface. Due to these micro-tolerances, any vibrations on the plant floor such as from forklifts, are going to be detected in the readings. To counteract these vibrations, we selected negative-stiffness vibration isolation. Negative-stiffness vibration isolation systems enable vibration-sensitive instruments, such as laser interferometers, to operate in harsh conditions and severe vibration environments. Negative-stiffness isolators, engineered by Minus K Technology use a completely mechanical concept in low-frequency vibration isolation; they do not require electricity or compressed air. There are no motors, pumps or chambers, and no maintenance because there is nothing to wear out .They operate purely in a passive mechanical mode. 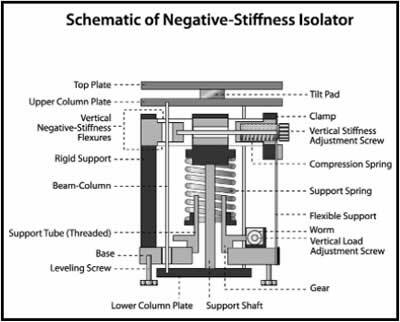 In this vibration isolation system, vertical-motion isolation is provided by a stiff spring that supports a weight load, combined with a negative-stiffness mechanism. The net vertical stiffness is made low without affecting the static load-supporting capability of the spring. Beam-columns connected in series with the vertical-motion isolator provide horizontal-motion isolation. A beam-column behaves as a spring combined with a negative-stiffness mechanism. The isolator provides 0.5 Hz isolation performance vertical, and 0.5 Hz horizontal, using a totally passive mechanical system. For an isolation system with a 0.5 Hz natural frequency, isolation begins at about 0.7 Hz and improves with increase in the vibration frequency. The natural frequency is more commonly used to describe the system performance. Negative-stiffness isolators resonate at 0.5 Hz. At this frequency, there is almost no energy present. 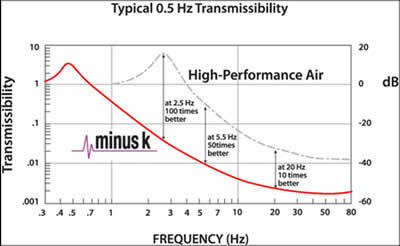 It would be rare to find a significant vibration at 0.5 Hz. Vibrations with frequencies above 0.7 Hz [where negative-stiffness isolators begin isolating] are rapidly attenuated with increase in frequency. Also transmissibility with Negative-stiffness isolators is substantially improved over air systems. Transmissibility is a measure of the vibrations that are transmitted through the isolator relative to the input vibrations. The negative-stiffness isolators, when adjusted to 0.5 Hz, achieve 93% isolation efficiency at 2 Hz, 99% at 5 Hz, and 99.7% at 10 Hz.